The United States is currently a net importer of natural gas, but the recent expansion in shale gas production is changing that. 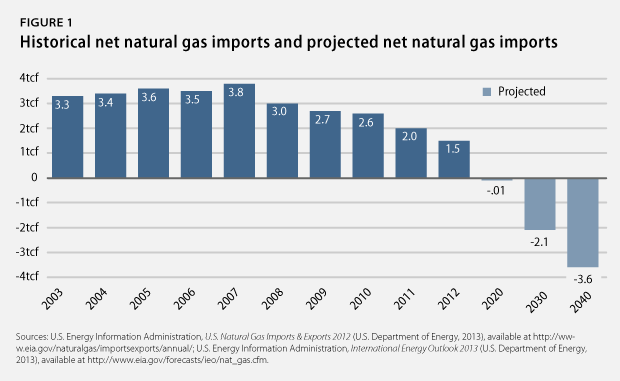 As the United States’ natural gas supply has grown, net imports have been on a downward trend. In 2012, for example, net imports decreased by 23 percent, reaching their lowest point since 1990. 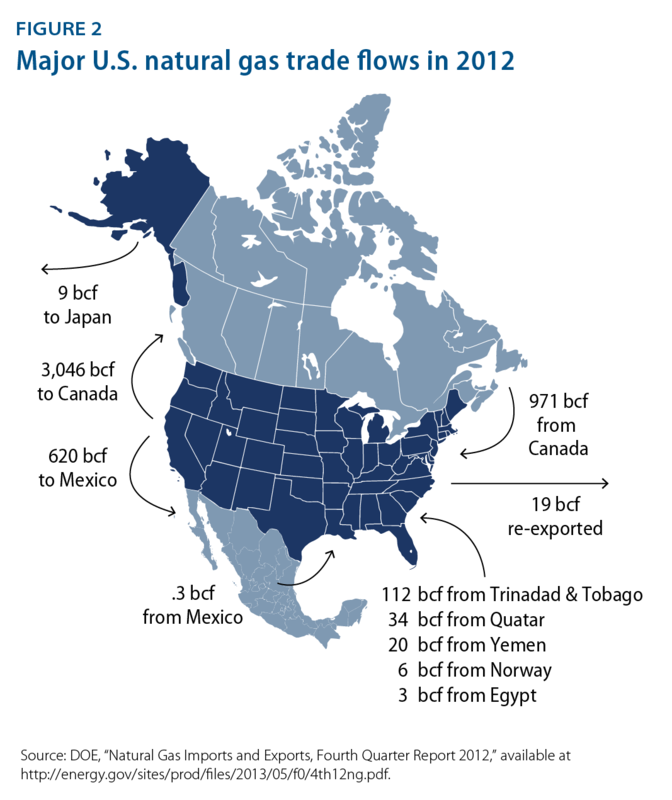 The United States is now expected to be a net exporter of natural gas by 2020. A substantial increase in natural gas exports could have a number of effects, including increased natural gas and electricity prices, increased gross domestic product, or GDP, and increased production of natural gas through fracking. A debate is therefore unfolding about whether a dramatic rise in export volumes should be prevented or encouraged. There is growing bipartisan support for increased exports, although a vocal opposition remains. Two facts inform this question. First, the only countries with pipeline access to the United States are Canada and Mexico. Natural gas exported to countries overseas is sent by vessel after first being liquefied. This is because the volume of natural gas in its liquid state is a small fraction of its volume as a gas, which facilitates transport. Discussions about entering new natural gas markets overseas, therefore, refer specifically to liquefied natural gas, or LNG. Second, many natural gas importers, including France, Japan, the United Kingdom, and Spain, do not currently have free-trade agreements, or FTAs, with the United States. An FTA between two or more countries is an agreement to mutually open their markets by reducing trade barriers such as tariffs. A company seeking to export LNG to either FTA or non-FTA countries must first submit an application to the U.S. Department of Energy, or DOE. 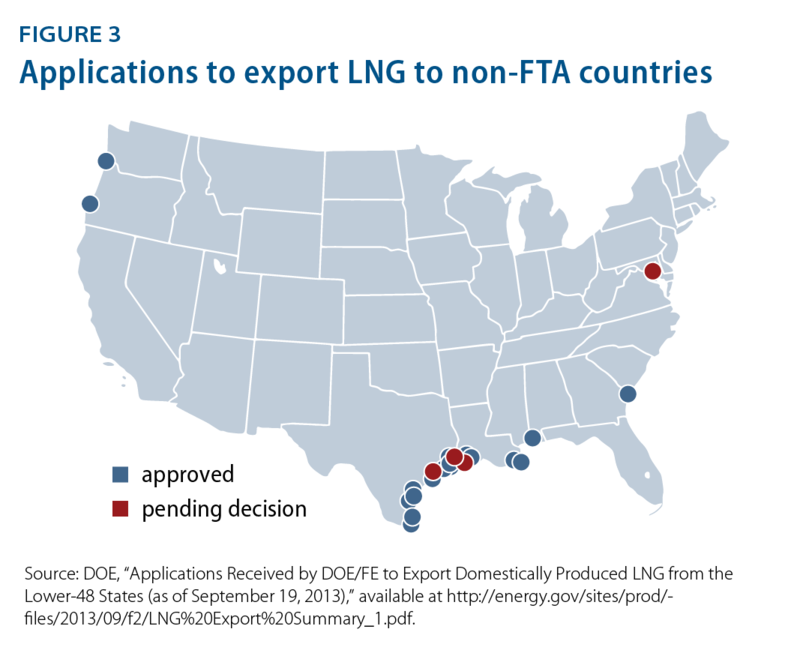 As the Natural Gas Act requires, DOE summarily approves applications to export LNG to FTA countries. Applications to export LNG to non-FTA countries, however, go through a public comment period, after which DOE may approve or deny them. The question then becomes: Should the United States allow a significant increase in LNG exports beyond the quantities traded with its FTA partners? That is, should DOE approve applications to export LNG to non-FTA countries, given the potential economic and environmental impacts? As of September, DOE has already approved four applications for long-term authorization to export LNG to non-FTA countries. The total volume of LNG approved for export to non-FTA countries is now 6.37 billion cubic feet, or Bcf, per day, which is firmly in the range that analysts think will have significant impacts on the economy, geopolitics, and the environment. DOE approved roughly two-thirds of that volume within mere months—from May to September—and Platts reports that it could rapidly approve up to three more applications before a respite to consider new data on the potential effects on the U.S. economy.5 More than 20 applications are awaiting a decision in DOE’s queue. Each of these topics could be discussed much more expansively. The purpose of this issue brief is to provide a useful primer for policymakers, stakeholders, and advocates by concisely mapping the terrain of LNG exports, their effects, and the resulting debate. 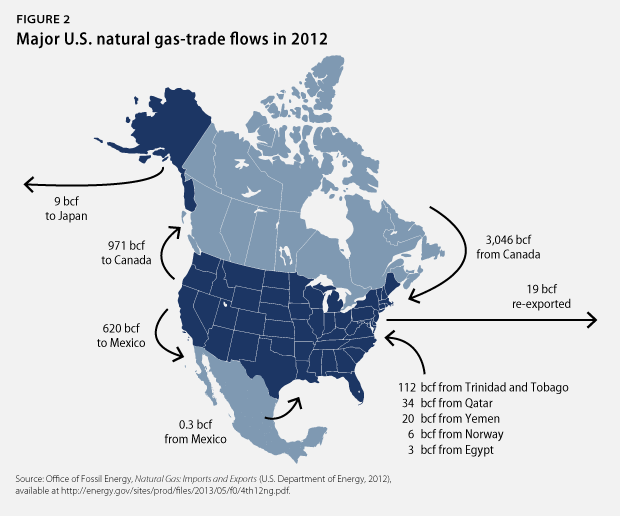 In 2012, the United States was a net importer of natural gas. It imported a total of 3,135 Bcf and exported a total of 1,619 Bcf. Only 9.5 Bcf of the exported volume were in the form of LNG exports, and the vast majority of that—9.3 Bcf—came from Alaska, which is typically considered a separate market from the lower 48 states because of its physical isolation. The remaining volume was in the form of pipeline exports, 1,591 Bcf of which went to Canada and Mexico, or LNG re-exports, 18. Bcf of which went to Japan, Portugal, Brazil, and India. Re-exports are foreign shipments of LNG that are stored at U.S. import terminals before being exported abroad; the idea is to buy these shipments low and wait until they can be sold high. The landscape of LNG exports is changing. Given the shale gas expansion in the lower 48 states and given that some of the largest markets for LNG are currently non-FTA regions such as Japan and Europe, U.S. energy companies and non-FTA countries are seeking long-term contracts for considerable volumes. Cheniere Energy, for example, which is the company behind the LNG terminal under construction at Sabine Pass, has signed 20-year contracts with companies such as Spain’s Gas Natural Fenosa, the United Kingdom’s Centrica, and India’s GAIL Limited. Again, DOE has approved more than 6.37 Bcf per day, or 2,325 Bcf per year, in exports to non-FTA countries, and the United States is expected to be a net exporter by 2020. In May 2011, DOE granted long-term authorization for the Sabine Pass terminal to export LNG to non-FTA countries. The Sabine Pass terminal is permitted to export up to 2.2 Bcf per day for 20 years and is scheduled to begin its exporting operations in 2015 or 2016. 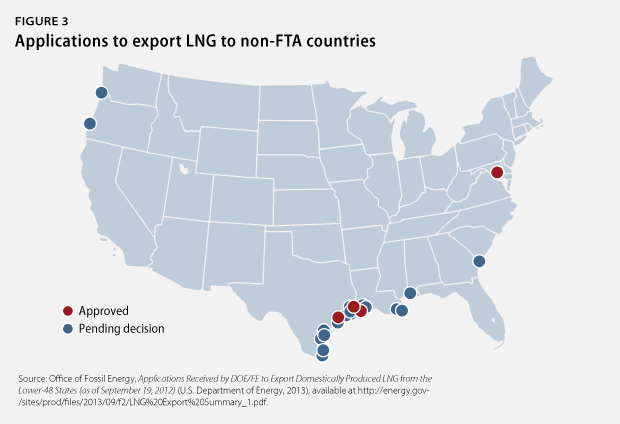 In May, after a pause of two years to consider the potential economic effects of increased LNG exports in a report that DOE commissioned from NERA Economic Consulting, DOE granted long-term authorization for the Freeport terminal to export LNG to non-FTA countries. The terminal is permitted to export up to 1.4 Bcf per day for 25 years and is scheduled to begin its exporting operations in 2018. Two authorizations quickly followed. In August, DOE granted longterm authorization for the Lake Charles terminal, which is permitted to export up to 2 Bcf per day for 25 years. In September, DOE granted long-term authorization for the Cove Point terminal, which is permitted to export up to 0.7 Bcf per day. Only the Sabine Pass project has obtained approval from DOE and FERC. The other three DOE-approved projects are awaiting decisions from FERC. There is a two-part regulatory process for companies that seek to export domestically produced LNG. First, the Natural Gas Act, or NGA, requires companies to obtain permission from DOE, which must approve the application unless it finds that the project is at odds with the public interest. Exports to FTA-countries are understood to be in the public interest and are automatically approved. Twenty-eight applications to export domestically produced LNG to FTA countries have been approved or are pending approval, beginning with an application from Sabine Pass Liquefaction LLC, which was filed in August 2010 and approved the following month. The [Secretary] shall issue such order upon application, unless after opportunity for hearing, [he] finds that the proposed exportation or importation will not be consistent with the public interest. The NGA therefore imposes a rebuttal presumption: The burden of proof does not lie with proponents of the export project—who are not required to prove that the project is beneficial to the country—but with opponents, who must demonstrate to DOE that the project is detrimental. According to DOE’s four orders to approve exports to non-FTA countries, the department considers economic, geopolitical, and environmental considerations relevant to the public interest, as well as the levels of domestic supply and demand for natural gas. Opponents have so far been unsuccessful in preventing DOE approval. The current actors and maneuvers in the LNG debate are explained in the last section of this primer. DOE approval is conditional upon an environmental assessment of the project conducted by FERC. Section 3 of the Natural Gas Act also states that FERC is responsible for approving the siting and construction of LNG export facilities on and near shore. It regulates facilities in its jurisdiction for the duration of their operational lifespans. Twenty-four operational facilities are now under its purview. FERC also conducts environmental assessments. The National Environmental Policy Act, or NEPA, requires full environmental impact statements, or EIS—which provide a comprehensive review of environmental and climate impacts—for LNG projects at new and converted terminals that will have a considerable effect on the environment. An EIS must also identify any other acts that apply to the project, such as the Clean Water Act and the Endangered Species Act. To date, only the Sabine Pass project, which has pivoted from LNG imports to LNG exports, has obtained both DOE and FERC approval. It is now under construction. The environmental assessment for the Sabine Pass operation contended that an EIS was not required. FERC reasoned that the liquefaction facility does not pose a significant environmental threat, given that it is sited at an already existing terminal. This is despite the fact that increased exports will increase fracking, which is why the Sierra Club has opposed the lack of EIS. The Freeport, Lake Charles, and Cove Point applications—all of which have been approved by DOE—are awaiting a decision from FERC. The volume of liquefied natural gas is approximately 1/600 the volume of natural gas in its gaseous state. It is therefore liquefied—by being cooled to approximately -161 degrees Celsius—before it is transported by vessel. Liquefaction is an energy-intensive process with significant costs. 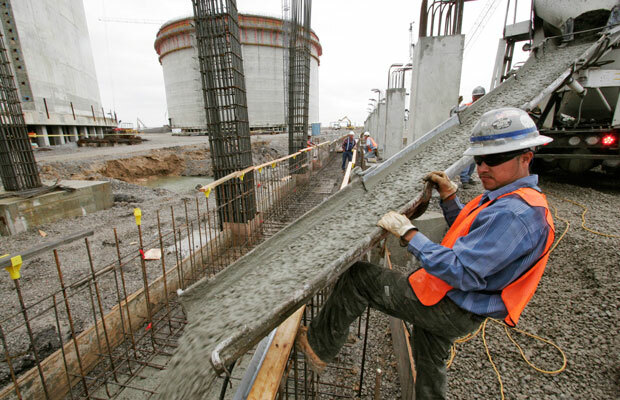 Cheniere Energy has estimated a cost of $3.07 per million cubic feet, or Mcf, for liquefaction. Its contracts have priced LNG at 15 percent more than the Henry Hub spot price, which would help compensate for the natural gas needed to power the liquefaction process, in addition to assessing fixed fees. Liquefaction also involves a considerable upfront cost. Michael Ratner and others at the Congressional Research Service estimate a cost of $6 billion to $10 billion to build liquefaction facilities at an adapted LNG import terminal and a cost of approximately $20 billion to build a new terminal. LNG is shipped in specialized carriers with a double hull to avoid leaks and spills. To keep the natural gas in its liquid state, some of the LNG vapor is vented, after which it can be captured and used as a fuel source for the vessel, which keeps the LNG at its boiling point and the pressure within the tank constant. This technique is called auto-refrigeration. Cheniere Energy estimates a cost of $1.02 per Mcf to ship LNG to Europe and $3.07 per Mcf to ship it to Asia. LNG is warmed at re-gasification terminals in the importing country and delivered to consumers via local pipelines. In its report “The Future of Natural Gas,” MIT estimates a cost of $0.72 per Bcf for re-gasification. Analysts tend to estimate the combined cost of liquefaction, transport, and re-gasification in the range of $4 to $6 per Mcf. There is disagreement over whether natural gas will remain abundant and affordable in the United States for the foreseeable future. Shale gas is a limited natural resource, and there is concern about the age and future productivity of some of the major U.S. shale plays. On the other hand, the American Gas Association maintains that the supply and price of natural gas will be stable beyond the near term, and the U.S. Energy Information Administration, or EIA, predicts that U.S. shale gas production will increase from 4.9 trillion cubic feet, or Tcf, in 2010 to 16.7 Tcf in 2040. EIA’s 2013 assessment of technically recoverable shale gas resources was 10 percent higher than the assessment in its 2011 report. Most reports and studies find that it is not unreasonable to predict or consider export volumes of 6, 12, or 18 Bcf per day. Michael Levi, who is an energy expert at the Council on Foreign Relations, focuses on a scenario of 6 Bcf per day; EIA and NERA focus on scenarios of 6 and 12 Bcf per day; and Wallace E. Tyner, an energy policy expert at Purdue University, focuses on scenarios of 6, 12, and 18 Bcf per day. Selected non-FTA countries in the Pacific Basin: There is a general optimism that demand from Japan will remain strong. Japan has scant natural gas resources; nearly all of its consumption comes from LNG imports. In addition, the Fukushima disaster created a surge of demand in 2011, as most of Japan’s nuclear generating capacity was brought offline. Japan is currently the world’s largest importer of LNG: It imported 4,200 Bcf in 2012, more than half of which was purchased from Qatar, Malaysia, and Australia, and an EIA forecast has Japan’s consumption increasing 1.8 percent annually until 2020. After 2020, Japan’s demand may begin to flatten if nuclear generation returns. The future of nuclear power in Japan is uncertain. It is possible that India will become a considerable consumer of natural gas over the coming decades as well. An International Energy Agency, or IEA, forecast puts India’s compound average annual growth rate at 6.5 percent from 2008 to 2035. China imported only one-third of the amount of natural gas imported by Japan in 2012, but an EIA forecast has China’s import levels nearing Japan’s 2012 levels by approximately 2020 and eventually outstripping Japan’s import levels by 2030. The EIA puts China’s imports at 3,708 Bcf in 2020; in contrast, it puts Japan’s imports at 4,485 Bcf in 2020. Selected non-FTA countries in the Atlantic Basin: The United Kingdom and Spain are already major importers of LNG, importing 494 and 742 Bcf of LNG in 2012, respectively. In the United Kingdom, for example, domestic production of natural gas declined nearly 15 percent from the first quarter of 2012 to the first quarter of 2013, while demand increased 11.5 percent. Imports increased 7.6 percent over the same period. From 2009, the U.K.’s imports have been predominantly from Qatar. The U.K.’s Centrica has now signed a 20-year contract to import LNG from Cheniere’s Sabine Pass operation. Germany, France, and Italy are currently major importers of natural gas that arrives by pipeline from Russia, Norway, and the Netherlands. Dramatically increasing the level of LNG exports would have a number of economic, geopolitical, and environmental consequences. The prospect of ramping up exports has therefore begun a contentious debate. There is widespread agreement among EIA, NERA, Wallace Tyner, and many others that increased LNG exports would put upward pressure on the price of natural gas in the United States. This, in turn, would put upward pressure on the price of electricity. The specific amounts by which natural gas prices would increase are contested. EIA, for example, considers four possible scenarios: a low level of exports at 6 Bcf per day phased in quickly at 3 Bcf per day annually; a low level of exports phased in slowly at 1 Bcf per day annually; a high level of exports at 12 Bcf per day phased in quickly; and a high level of exports phased in slowly. 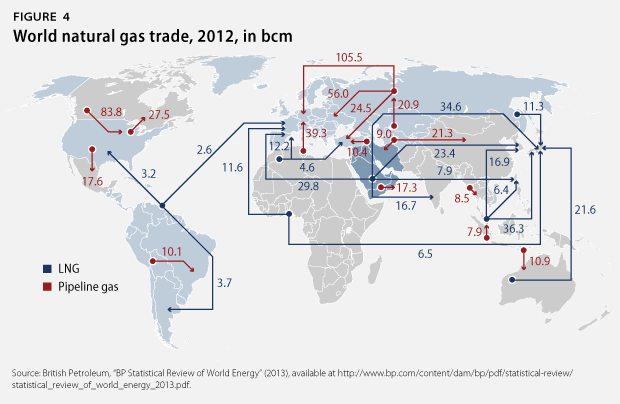 It finds that increased exports cause increased prices of natural gas in all scenarios. The price increases in the scenarios peak between 14 percent and 36 percent above the reference case; they then drop to below 20 percent by 2035 for the high-export scenarios and to below 10 percent for the low-export scenarios. Of the scenarios considered by NERA, the highest increase in domestic wellhead prices is 20 percent more than the reference case in 2020. This level then drops to less than 15 percent by 2035. NERA views EIA’s scenario that produces a 36 percent increase—the “high/rapid” scenario—to be merely theoretical, given that the United States would be in competition with other LNG exporters. Charles Ebinger, an expert in energy markets at the Brookings Institution, makes the same point, citing the fact that Australia has more than 9 Bcf per day of LNG export capacity that is expected to come online around 2015—just as Sabine Pass is scheduled to become operational. Charles River Associates, however, which produced its LNG report for Dow Chemical, found that these scenarios of high exports are possible and contends that NERA overestimates the cost of liquefaction, transport, and re-gasification in its analyses. Wallace Tyner and his colleague Kemal Sarica find peak price increases that are higher than those found by NERA and EIA. In their scenario of 6 Bcf per day, the price increase climbs to 16 percent above the reference case by 2035; in the scenario of 12 Bcf per day, the price increase peaks at 41 percent in 2035; and in the scenario of 18 Bcf per day, which NERA and Ebinger would likely argue will not come to pass, the price increase climbs to 47 percent in 2035. Despite the higher price of natural gas in the United States, NERA concludes that increased LNG exports would provide a net economic benefit in any scenario. It further concludes that unlimited exports would provide the greatest net economic benefit. Under the reference case, the highest increase in GDP of NERA’s core scenarios in 2015 is 0.05 percent, and the highest increase in 2020 is 0.11 percent. Michael Levi also predicts a net benefit. The EIA estimates that 60 percent to 70 percent of exported natural gas would come from new production, and the remainder would come from diverted gas that would have been consumed domestically. In the scenario of 6 Bcf per day, Levi argues that the losses associated with decreased natural gas consumption in the United States would be exceeded by the gains from increased production and from the higher prices that the diverted gas would fetch overseas. He estimates a net gain of $3.1 billion to $3.7 billion per year. Sarica and Tyner, in contrast, find that increased exports carry a net cost. According to their model, the gains from exports do not compensate for losses in energy-intensive sectors and in electricity. They find that exports would result in a decrease in GDP of 0.04 percent to 0.17 percent below the reference case. Despite their differences, both the NERA and the Sarica/Tyner studies find a net macroeconomic effect from trade—positive, according to NERA, and negative, according to Sarica/Tyner—that is arguably insignificant compared to total U.S. GDP, which was $15 trillion in 2011. The macroeconomic gains from trade predicted by NERA and EIA would not be spread across the economy. They would go primarily to natural gas producers, shareholders, and landowners. In contrast, households with annual incomes of less than $20,000 would be harmed by higher natural gas and electricity prices, which could cost them $50 per year. In addition, the risks to public health and the environment that would come with the increased fracking needed to support LNG exports would disproportionately affect households near shale plays. –Increased production: The majority of export volumes would be supplied by increased production. EIA has forecasted that approximately 60 percent to 70 percent of exports would come from new production, three-quarters of which would come from shale by fracking. The remainder would come from existing production that otherwise would have gone primarily to power generation. The United States would therefore incur the carbon dioxide and methane emissions associated with the additional production. The prospect of substantially increasing fracking is therefore worrisome from a climate perspective. It is also worrisome from an environmental and public health perspective. Fracking carries a number of well-known and serious risks to local environments and communities, including water and air pollution and habitat destruction. Additional fracking would extend these risks to a larger swath of the country. –Methane leakage: Methane is a potent greenhouse gas, and the Intergovernmental Panel on Climate Change, or IPCC, reported in September that it is even more potent than we previously believed. In its fifth assessment report, IPCC revised the global warming potential, or GWP, of methane from a GWP of 25 to a GWP of 34 over a 100-year period. This means that methane traps 34 times as much heat as carbon dioxide over that timeframe. Over a 20-year timeframe, IPCC revised the GWP of methane upward from 72 to 86. Methane emissions are not only a problem at production sites. Throughout the lifecycle of natural gas—from production to transmission to end use—methane escapes into the atmosphere. Methane leakage therefore could cause significant harm to the climate. –Liquefaction, transport, and re-gasification: Transforming natural gas into a liquid, shipping it, and then transforming it back into a gas are energy and emissions intensive. James Bradbury, a natural gas expert from the World Resources Institute, calculates that liquefaction, transport, and re-gasification increase greenhouse gas emissions from onshore production by 15 percent. –Electricity demand: Higher domestic natural gas prices would dampen electricity demand in the United States, and lower international prices would have the opposite effect abroad. This would put downward pressure on emissions from electricity generation in the United States and upward pressure on emissions from electricity generation in the importing country. –Fuel switching: Shifts in the price of natural gas could cause fuel switching in sectors including electricity generation. This could be in the form of natural-gas-to-coal switching in the United States, which would increase domestic emissions, given that the combustion of natural gas produces roughly half as much carbon dioxide as the combustion of coal. A return to coal in the United States could be avoided, however, through the implementation of the Obama administration’s rules for new and existing power plants. In the importing country, a drop in the price of natural gas could cause coal-to-natural-gas switching in the generation of electricity, which would put downward pressure on emissions. Increased natural gas and electricity prices in the United States would harm natural gas-intensive and energy-intensive sectors, such as manufacturing and electric power, in terms of both output and labor. NERA predicts that the steepest declines in the output of the electric power sector would be between 0.2 percent and 1 percent depending on the scenario, and it predicts that the steepest declines in the output of energy-intensive industries such as chemical manufacturing, primary metal manufacturing, and paper manufacturing would be between 0.2 percent and 0.8 percent. Chemical manufacturing has benefited from the shale gas expansion and the resulting affordability of natural gas not just because its energy costs have been reduced but also because it uses natural gas as a feedstock. Sarica and Tyner predict a decline in energy use in chemical manufacturing of 1.8 percent to 3.8 percent in 2035, depending on the volume of exports, and in other natural gas-intensive sectors such as primary metals and paper manufacturing, which is indicative of declines in output. Increased exports would have the advantage of allowing the United States to strengthen its relationships with its allies. If the United States were able to export substantial volumes to Japan or Germany, for example, those countries would have more options and therefore more ability to negotiate favorable contracts. They would also have more protection against supply disruptions. Increased exports would also allow the United States more influence in any more general trade negotiations with an importer. Allowing exports to non-FTA countries would also save the United States from contradicting its free-trade commitments under the World Trade Organization, or WTO, and WTO’s General Agreement on Tariffs and Trade, or GATT. GATT bars long-term limits on exports, although it allows some exceptions for reasons including the conservation of natural resources. Not only is the United States a member of the WTO, but it also has filed complaints with the organization against export limitations, such as a complaint against China’s limits on exports of rare earths. There is growing bipartisan support for LNG exports to non-FTA countries. In July, 34 senators, including 11 Democrats, signed a letter urging DOE to make decisions quickly and to evaluate applications in bulk rather than on a case-by-case basis.61 In addition, the bipartisan Expedited LNG for American Allies Act of 2013 was introduced in January, which would give Japan and NATO members the same privileges as FTA countries when it comes to importing U.S. LNG.62 As of September, the bill remains in committee. Economic, trade, or geopolitical considerations generally drive support for increased LNG exports. Natural gas producers, for example, are eager to exploit new markets. Groups such as America’s Natural Gas Alliance, which represents production and exploration companies, strongly oppose government interference or time-consuming reflection. LNG companies are eager for their applications to be approved quickly. It takes years for a facility to become operational after it is approved. LNG companies are therefore pushing for timely authorization so they can capture a slice of global demand before it is met by non-U.S. suppliers. Sen. Lisa Murkowski (R-AL) has been supportive of this; she has argued that there is a narrowing window of opportunity for the United States to be a part of the global LNG market and reap its economic benefits. Many politicians are also eager to secure the temporary jobs that would accompany increased exports; to improve the trade balance; and to strengthen relationships with U.S. allies. Some are also ostensibly eager to secure global emissions reductions. These justifications are cited in the letters to DOE—from Sen. John Cornyn (R-TX), former Rep. Ron Paul (R-TX), Sen. Mary Landrieu (D-LA), Rep. John Fleming (R-LA), and many others—in support of the applications approved to date. Free-trade advocates argue for unobstructed global competition. In a notable letter in response to the Freeport application, for example, Professor Graham Davis from the Colorado School of Mines argued that limits on exports would subsidize domestic manufacturing operations and shield them from the true cost of natural gas. Despite this growing bipartisan support, many parties remain strongly opposed to—or suspicious of—the prospect of dramatically increased exports. A number of parties are concerned about the effect of increased electricity and natural gas prices on U.S. households, the U.S. manufacturing sector, and the macroeconomy. Sen. Wyden is not opposed to LNG exports to non-FTA countries altogether, but he has urged caution. He has also made the point that the debate sometimes falls into a false dichotomy: The question is not whether the United States should bar all of these export applications or sanction them all. He makes a case for a middle road on which the United States approves a volume of LNG for export that would be high enough to allow the United States to be a good trading partner for its allies but low enough to avoid a large increase in domestic prices. Groups representing manufacturing interests, such as Industrial Energy Consumers of America and America’s Energy Advantage, are likewise concerned about the effect of increased exports on the price of natural gas and electricity. They argue that the shale gas expansion and the subsequent abundance and affordability of natural gas has revitalized the U.S. manufacturing sector, which now provides economic and employment benefits that would not be matched by LNG export operations. Charles River Associates, which produced its LNG report for Dow Chemical, has made these claims as well. Its report finds, contrary to the NERA report, that employment, the trade balance, and the net macroeconomic benefit are all better served if natural gas is used for domestic manufacturing rather than LNG exports. The Sierra Club has filed a number of unsuccessful motions to intervene with DOE and FERC. The impact of increased exports on fracking levels is a topic that is not receiving sufficient attention. Export operations are being approved even as parts of the United States such as Massachusetts rely on imported natural gas, including quantities from unstable countries such as Yemen. Sen. Edward Markey (D-MA), for example, is concerned about the possibility of supply disruptions, which could cause price spikes; he is also concerned about the possibility of terrorism, as LNG tankers from abroad pull into the Everett terminal through the Boston Harbor. Natural gas groups publicly maintain that supply in the foreseeable future will remain abundant. If supply is truly plentiful enough to cover both exports and domestic demand, Sen. Markey would not need to oppose exports as he seeks energy security for the northeast; he could focus exclusively on promoting the construction and maintenance of adequate pipeline systems. There is legitimate concern, however, about future supply, as was already noted in this brief. Many parties have sought greater transparency from DOE over the years on the approval process and the criteria it considers to be relevant to the public interest. In addition, Sens. Wyden and Murkowski have asked DOE to clarify the conditions under which it might revoke permission for a company to export LNG to non-FTA countries. Many parties have also called for better information about the impacts of significant export volumes on the U.S. economy. Sen. Wyden, for example, has urged DOE to seek more trustworthy data than those provided by the report it commissioned from NERA, which he claims needs to take into account new EIA forecasts and better market assumptions. The NERA report was controversial and elicited hundreds of comments to DOE upon its release. This brief has presented an overview of a number of major geopolitical, economic, and environmental and climatic impacts of increasing U.S. LNG exports. There are undoubtedly additional impacts to weigh as well. Manufacturing and free trade: Should U.S. manufacturing be sheltered? What would the effects of this be on the economy, employment, and trade relations? Distributive justice: How could low- and middle-income households be compensated for any harm caused by increased exports? Environment and climate: How would increased exports affect U.S. and global emissions? What would be the extent of the environmental damage from increased fracking? What would be the environmental impact abroad from possible fuel switching? U.S. natural gas supply and energy security: What is the reality of U.S. shale gas supply and its ability to meet both domestic and foreign demand? What are the effects on energy security? DOE should pay particular attention to these questions as it manages the approvals process. If it does not have adequate information to answer them, it would be sensible to commission authoritative studies before approving additional applications. Gwynne Taraska is a visiting Research Associate for Energy and Environment at the Center for American Progress. She is also the research director and the interim director of the Institute for Philosophy and Public Policy at George Mason University.